When looking at the kitchens today, it’s always fun to think back through the eras and notice the influences in kitchen styles and trends. The period between 1900 and 1920 saw much advancement in science and technology in the United States, which came to be reflected in kitchen design and operation. Advancements in manufacturing made consumer products more widely available, as well as more affordable. This affected kitchen styles, which shifted away from the primarily utilitarian kitchens of the 1900’s to the gleaming, stylish kitchens ideal of 1920. 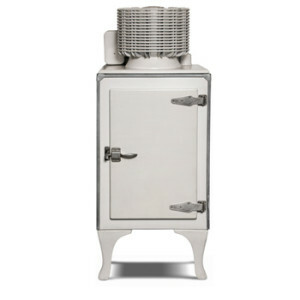 During this time, the cook stove was the central feature, and in the early 1900s, it was likely to be a wood burning stove in the average household. Gas stoves were available, but not widespread, and certainly not something likely to be found in the average home. Kettles of water were usually simmering, as that was the source of hot water for cleanup throughout the day, and kitchen sinks tended to be freestanding, with the bowl of the sink sized to accommodate a variety of tasks. Drainboards soon became a standard part of kitchen sink design, and storage space was freestanding, often open shelving. To keep food cool, there were ice boxes, but longer term cold storage was not yet common. As the relationship between germs and disease became more widely understood, and as science itself became a popular cultural interest, many changes became present in the kitchen. The kitchen of 1920 was a well lit place, thanks to electricity and light bulbs. Surfaces, including the floor, were much easier to keep sterile and clean, something that popular women’s culture made sure all mothers knew was an essential part of their homemaking tasks. The scientific approach to housekeeping and child rearing was all the rage. Enamel coated the sinks and tables and linoleum became increasingly popular for floors. By 1920, the electric stove had made its appearance. However, the gas stove, which finally passed the wood burning stove’s common usage, was typical. In contrast to the black cast iron wood stove, gas stoves were enameled in a bright, clean looking white, often with decorative flourishes. Iceboxes were still in use, and usually placed on the wall near the back door to make it easier for ice delivery. Built in, closed door cabinets were becoming a part of kitchen design and countertop workspaces began to make their appearance, though the typical kitchen still relied on the kitchen table for additional workspace. 1920 saw modern kitchen styles come into being. Occasionally looking back at the influences different eras had over our current kitchens will not only allow you to be grateful for what you currently have, but to appreciate where each element came from and how much it has changed throughout the years.